These trailers are road-legal to handle ATVs, bikes, or cargo. They are available with optional Fat Boy tires for better flotation. Sizes available: 78" or 96" in length. Off-road users will be pleased to see 22" x 11-8" off-road knobby tires, a 1" axle with bearings, and a body made from 14-gauge steel powder coated. Trailer will hold most items you can imagine. 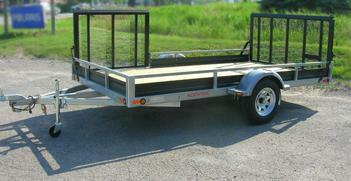 Comes complete with 1 7/8" coupler, removable tail gate, dump latch, and tie-down loops. Available in 2 sizes: 4' or 5' in length. 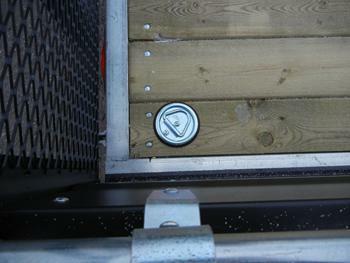 Galvanized flat-bed utility trailer with wooden deck and lift ramp makes loading a snap. Model shown is the 78-12DR with painted side panels. Load 'em and haul away! Add-on tongue jack and spare tire are additional values. 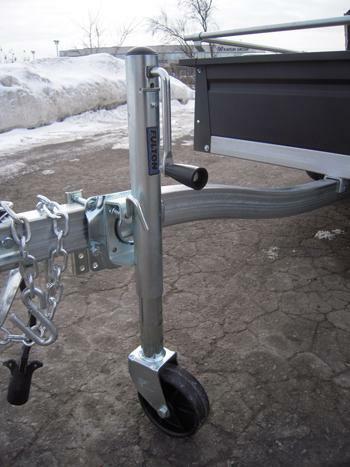 Classic edition features folding rear ramp, optional side rails, tongue jack, tie down rings. 2" coupler and side panels are standard equiptment. Weights capacity is 1600 lbs. Space a problem? Haul 2 atvs inline with either 14' or 16' length. 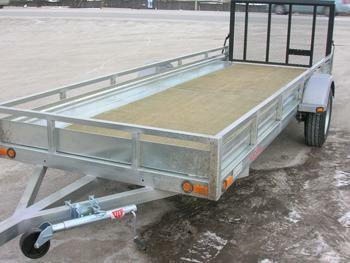 Trailer deck 61" wide and equipt with gaalvinize rails. 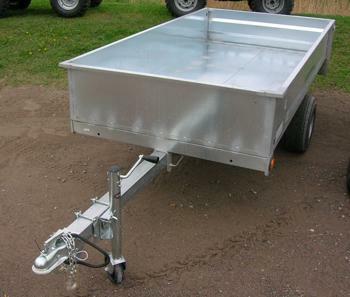 Add tonge jack and tie down rings to make your trailer ready for the haul. Limited build trailer with 50" rear ramp dimensions 79" wide by 142" long.Full size UTV will fit this model with room to spare. Holds trailer tongue horitzonal while not in use. Protect your winter sports vehicle while en route to the trails. 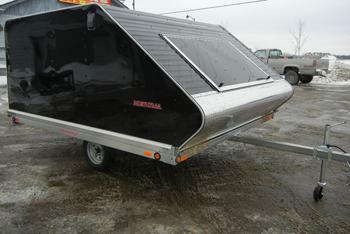 The Northtrail SE101 trailer has an aluminum deck lid, and added options include traction mats and interior lamp. Need more room for the toys? 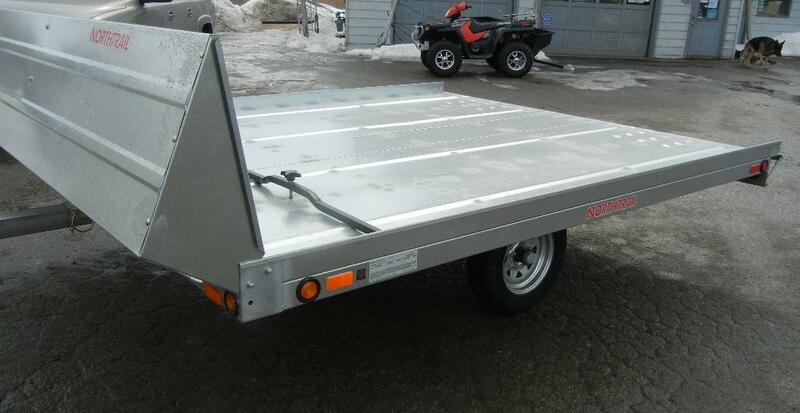 This four-bed sled/ATV trailer makes outings easier with one trailer. 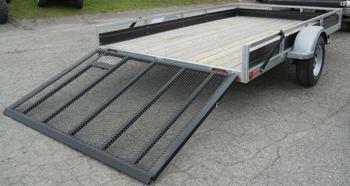 Pull-out rear loading ramp and removable front deflector for easy on/off for vehicles. Fits 2 sleds or ATV's on bed measures 101" wide x 120" long. Body is galvinized bed and front deflector. 2" coupler, 12 rims. Optional alumimun cap can be mount at a later date.